Is anyone else seeing a pattern here? For a show about nothing, 'Friends' really had an impact on my life. I segregated my own liaison circle into the categories based on the prime-time hit. There were the Rachels I drank bubbles with, the Joeys I ate cheesecake off the floor with, and the Monicas I called whenever I had to sort something out in my life. Then there were the Phoebes who always kept me guessing, and the Ross's, who I avoided at all costs. 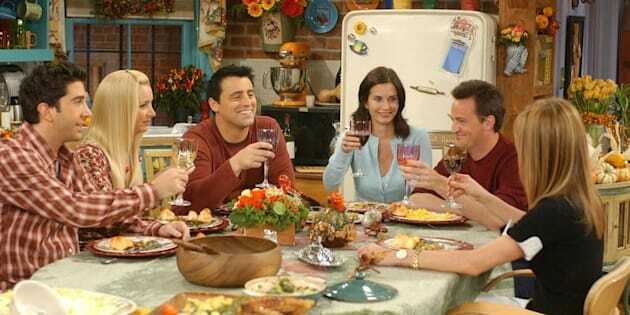 I'm not ashamed to admit that my favourite friends were the Chandlers. Their humour was dry, they were hard done by and their clever puns were always underestimated. When I think about my love of Chandler, I remember my favourite quote, and I start to question everything I ever thought my own friendships and relationships should be like. Monica: "Why is your family Scottish?!" Chandler: "Why is your family Ross?" To get this straight, Monica and Chandler are married and Chandler is Monica's brother's best friend. This is only the tip of the iceberg of incestuous behaviour, but a good place to start. There are nearly 800,000 single men in New York and Monica chose her brother's best (and oldest) friend to fall in love with. I somehow don't see my own sibling being quite as dandy if I made that same choice. Then there is Monica's brother, the dreaded Ross. Ross based his role on being the ultimate nerd, which is fine, and having a child with a lesbian, which is also fine. What is not fine is that Rachel fell pregnant to Ross, and Rachel is best friends with Ross's sister Monica. Monica was over the moon with this situation, particularly when they ended up together -- and for that, I have no words. Then things started to get a little crazy. Now Rachel, the one mothering her best friend's brother's child, she is an interesting one. Coming from a clichéd upper-class family, Rachel of course heroically moves to New York and ends up 'slumming' it in a spacious (easy $3 million+ apartment) while serving coffee. Until you blink your eyelids and suddenly she is the merchandising manager at Ralph Lauren, which is very 'you go girlfriend' until Joey became involved. Joey, lovable Joey, known for his awful acting and childlike intellect, also sorts out his career and falls madly in love with the woman who is carrying his best friend's child. And of course, eventually the best friend (and future father) is fine with it. Until he wins her back, then Joey is fine with them being back together. And of course, there is Phoebe. Phoebe is the one that no one really knows where she came from, or what she does, but she is just there and her purpose is confusing. If my life was a direct 'Friends' impression, I would have had my brother's best friend's baby, while dating his other friend. My closest friend would be married to a guy I like to argue with a lot and there would always be a blonde woman hanging around every time I drink coffee. Which despite my flawless complexion, is a lot. Either the writers swapped to daily Moet to celebrate their success, or the high-budget rumours were actually a myth, and they couldn't afford to cast external love interests.